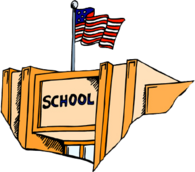 Download the agenda here: Agenda 2019.04.17.docx Griggsville-Perry Community Unit School District #4 Agenda Regular Meeting of the Board of Education 202 North Stanford Street Griggsville, IL 62340 April 17, 2019 7:00 p.m. Call to Order and Roll Call Public . . .
HS English Teacher --Requires a valid Illinois teaching license HS Basketball Coach Part-time Dishwasher Inquiries should be sent to hawleyk@griggsvilleperry.org or to Kent Hawley, 202 N Stanford, Griggsville, IL 62340. GRIGGSVILLE-PERRY MIDDLE SCHOOL ANNOUNCEMENT Friday, April 12th, 2019 It’s a GREAT day to be an Eagle! JH Chorus will be this Friday, April . . .
GRIGGSVILLE-PERRY ELEMENTARY & HS DAILY ANNOUNCEMENTS A DAY FRIDAY, APRIL 12th, 2019 HAPPINESS IS BEING A TORNADO! The following athletes have . . .
Clear, with a low around 45. South wind 3 to 5 mph.